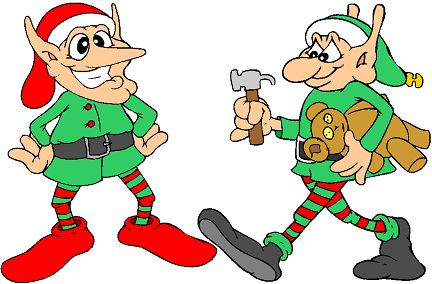 Elves are small magical people that help Santa Claus and Mrs Claus to prepare for Christmas. They are happy folk who love to sing and dance, and who enjoy their work. Santa's elves live in a village near the North Pole. Many eleves work in Santa's Workshop and make and wrap Christmas presents (especially toys, they love making toys). Some eleves also help in Santa's office (opening and sorting childrens' letters to Santa, and collating the naughty-or-nice information that Santa uses), and so on.